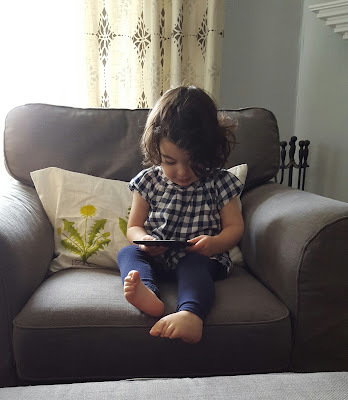 Though she's been two years old at heart for at least seven months, my little girl had her second birthday yesterday. And that means......it's Old Whisky Week on Diving for Pearls! Eighteen months ago, whisky enthusiast Cobo emailed me to see if I'd be interested in splitting a bottle of long defunct Ardbeg 30yo with his whisky club. I said yes. Cool story, bro. 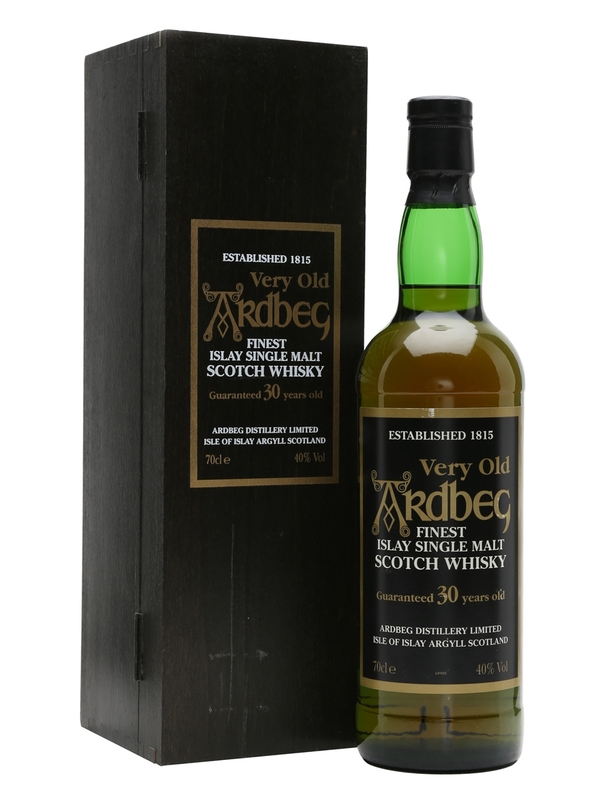 My only previous experience with old pre-GlenMo Ardbeg was via older bottles of Ardbeg Ten. But this whisky is not 10 years old. In fact, it sat in an unopened bottle for almost two decades. The distillate used was from 1967 or earlier, and was the product of the distillery's own malting floor. So, it's actually pre-Allied and pre-Hiram Walker. Thank you, Cobo, for this opportunity! Also, that's supposeed to be cumin on the right. Maturation: maybe refill ex-sherry and ex-bourbon casks??? Its color is dark gold. The nose begins with a very clean defined medicinal note. Then there's mesquite and a Peruvian spice rub. Loads of cumin. Its subtle peat reads similar to Kilkerran's, sort of twiggy and leafy. A soft note of peach skin underneath. 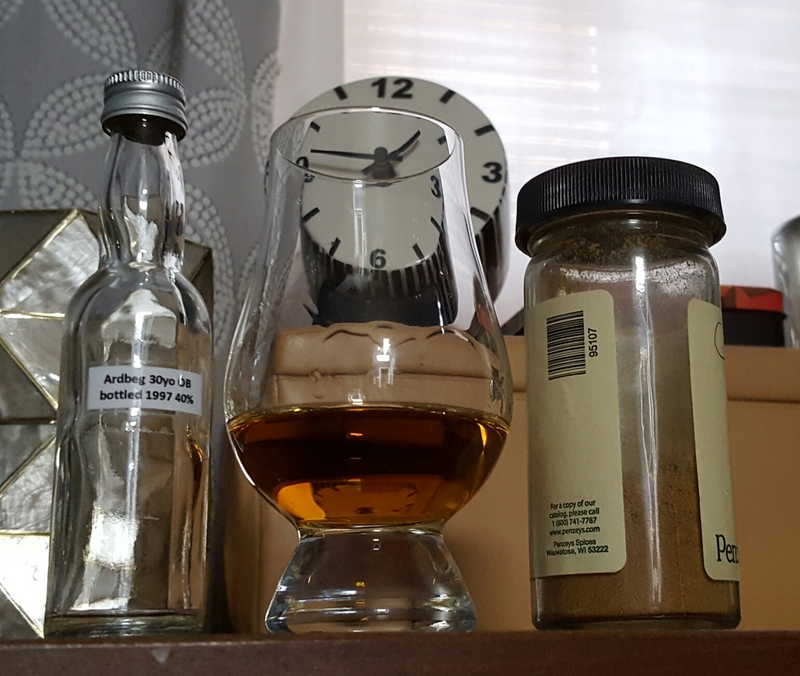 After 30+ minutes in the glass, the whisky picks up small notes of old furniture and menthol, as well as (more prominently) glazed donuts, a peach tart, honey, and pineapple. The palate begins very salty with a gradually building pepper and herbal bitter element. That's well balanced by notes of pears and white grapes with whipped cream and Kit Kat bars. Again, it's much subtler than today's Ardbeg, though there's a bite to it that builds with time. 30+ minutes later there's smoked shortbread, pie crust, and (not frosted) shredded wheat. A little bit of refill sherry cask action shows up in the finish, with hints of dried stone fruits (apricots and cherries) and Oloroso. Maybe a little of that pie crust. There's a wee puff of smoke and soft aromatic peat, but that stays in the background while salt, pepper, and horseradish lead the way. With its peat dialed back, this Ardbeg is so much more focused and graceful than anything distilled by the current ownership. Yes, that is partially due to its advanced age and partially from (what I'm assuming are) refill casks. But, take away the cask tinkering and the massive peating, then let the stuff sit for a generation and then maybe Bill Lumsden could get to this sort of whisky. Though that doesn't seem to be of interest over there. But my complaints about the current production are irrelevant to the quality of this 'Very Old' 30 year old. It feels heavier than 40%abv and really does well with lots of air. The nose, with its spices and fruit, is the star and its finish is even better than the palate. With the fruit, salt, and mellow peating it feels more Highland and (other) Island than what we're currently experiencing from southern Islay. I don't know if anyone is drinking this stuff anymore, but if you're reading this post and you have tried this whisky, please share your whisky thoughts in the comments below. The 1970s Ardbeg I got to try at the distillery was a similarly revelatory experience for me. Nothing is good enough to justify the prices they're going for, but it did convince me that at least some of the hype is real. Just went back and read that post again. That one was close in age and abv to this one. I really like that subtler peating since it allows for a lot of lovely non-peat notes to come through. Their current massive peating does mostly the opposite, leaving aggression and smoke as the main dish. A shame that this hasn't turned out to be anything more than a rumor. It would certainly cost them something to invest in this, but I doubt it would be more than a small fraction of their marketing budget. Priorities, I guess.